Fill the bottom of the vase with the Styrofoam block. Cut the pineapple into 1 inch slices. Using the cookie cutters, create heart and star shaped fruit. Remove the tops of the strawberries and discard. Set the strawberries aside. Melt the Candiquick milk and white chocolate according to the instructions on the package. Dip half of the strawberries and pineapple into the milk chocolate. Using a spoon, drizzle the white chocolate across the fruit. Set aside to dry. Place fruit in refrigerator for quick drying. 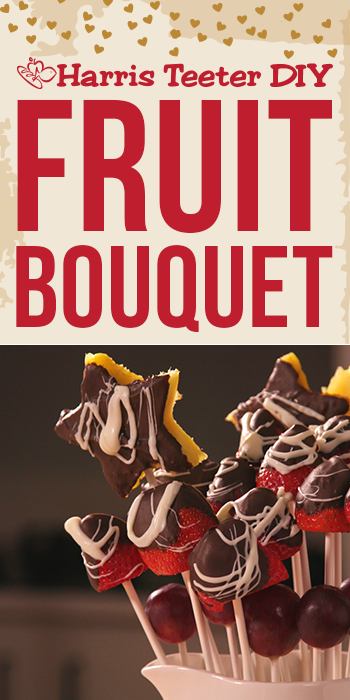 Once the chocolate has dried, thread the strawberries, grapes and pineapple onto the skewers. Poke the skewers firmly into the Styrofoam, spacing as evenly as possible. Fill in more fruit as needed. Store the bouquet in the refrigerator until it’s time to deliver.